Voice Artist Susan Sheridan R.I.P. Short of Drew Barrymore (the granddaughter of the legendary John Barrymore), today it is quite possible that Lionel Barrymore is the most famous member of that illustrious acting dynasty. Over the years Lionel Barrymore would play many impressive roles. He won the Oscar for Best Actor in a Leading Role as Stephen Ashe in A Free Soul (1931). He played Otto Kringelein in Grand Hotel (1932), Billy Bones in Treasure Island (1934), James Temple in Key Largo (1948), and Dr. Gillespie in the "Dr. Kildare" movie series. Despite having played a number of well received parts over the years, there can be little doubt that Lionel Barrymore's fame today rests primarily with one movie, It's a Wonderful Life (1946), in which he played the villain Henry F. Potter. 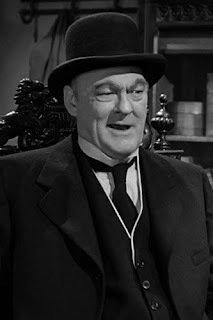 Not only is Henry F. Potter (more often than not called "Mr. Potter" or even more often simply "Potter") today the most famous role Lionel Barrymore ever played, he is so identified with the role that it is hard to picture anyone else in it. As hard as it is to believe, other actors were considered for the role. Both Dan Duryea and Charles Bickford had been in the running for the part. While both Messrs. Duryea and Bickford would have done well in the role, fortunately Lionel Barrymore got the role of Potter in the end. There can be little doubt that much of the reason Lionel Barrymore was cast as Henry F. Potter was the simple fact that he had played a similar role for literally years. Starting in 1934 for many years Lionel Barrymore played the role of Ebeneezer Scrooge in annual Christmas specials on CBS Radio. In fact, when MGM produced their version of A Christmas Carol (1938), they had originally intended to cast Lionel Barrymore in the role of Scrooge. 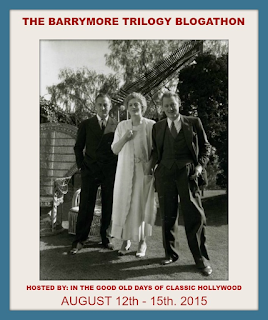 Unfortunately, while shooting retakes for Saratoga (1937), Mr. Barrymore tripped and broke his hip. In the end the role of Scrooge in the film went to his friend Reginald Owen. The similarities between Scrooge and Potter are immediately noticeable to anyone who has read A Christmas Carol by Charles Dickens (or seen one of the many screen adaptions) and has seen It's a Wonderful Life. Indeed, if anything else Potter is even worse than Scrooge. Time critic Richard Corliss once described Lionel Barrymore playing Potter as "...Scrooge, the Grinch and Simon Legree in one craggy, crabby package." One has to suspect that, unlike Scrooge, Potter could never have been reformed. Quite simply, he would have ordered the ghosts out of his bedroom and that would have been the end of it! Indeed, Potter is a thoroughly despicable person, one of the greatest screen villains of all time. Peter Bailey (played by Samuel S. Hinds), the father of George Bailey (played by James Stewart), describes him as "Frustrated and sick. Sick in his mind, sick in his soul, if he has one." Watching It's a Wonderful Life, there is not only some doubt as to whether Potter has a soul, but whether he has a heart as well. The first scene in It's a Wonderful Life to significantly feature Mr. Potter shows just how greedy and how lacking in compassion he can be. Seeking advice from his father, twelve year old George barges in on a meeting between Peter Bailey and Henry F. Potter. In the meeting Potter is calling in a loan of $5000 that he made to the Bailey Building and Loan. When Peter Bailey asks for thirty more days in which to raise the funds, Potter suggests that he foreclose on the Building and Loan's lendees. Peter points out to Potter that these are families with children to no avail. That's right. Potter has no problem throwing families with children out on the street! As It's a Wonderful Life progresses Potter does not get any better. In fact, he seems to only get richer and even meaner. It soon becomes clear that Potter either wants to own the Bailey Building and Loan or, at least, see to it that it is closed down. Indeed, not long after Peter Bailey has died Potter makes a motion at a Board of Directors meeting to dissolve the Building and Loan and "...turn its assets and liabilities over to the receiver." He is stopped only because George stands up to him. During the Depression, when there is a run on the bank, Potter makes an offer to buy Building and Loan shares for "fifty cents on the dollar." It is quite clear he doesn't simply intend to save the Building and Loan--he wants to either take control of it or kill it. Over the course of the film we learn that Potter has his own housing development. It is aptly named "Potter's Field", a traditional term used for a graveyard for paupers unable to afford burial in a better cemetery. Potter's Field would appear to be something of an overpriced slum. In trying to convince the customers of the Building and Loan not to go to Potter, George says to Joe (played by Ray Walker), "Joe, you lived in one of his houses, didn't you? Well, have you forgotten? Have you forgotten what he charged you for that broken-down shack?" During the Depression, Potter took control of Bedford Falls' bank, bus line, department store, and apparently every other business in town. As he tells George, "You saved the Building and Loan, and I saved all the rest. (to which George replies, "Yes. Well, most people say you stole all the rest.")" If somehow viewers had any doubts that Potter was evil, then they would be washed away by events leading up to the film's famous climax. When Uncle Billy stops to needle Potter in the bank, he unfortunately hands Potter a newspaper containing the $8,000 meant to be deposited for the Building and Loan. After discovering he has the money, rather than giving it back to Uncle Billy or depositing it in the Building and Loan's account for him (which as the owner of the bank and one of the Building and Loan's directors he could presumably have done), Potter simply keeps the money. That's right, As if there was any doubtabout it before, Potter is capable of outright theft. It is Potter's theft of the $8,000 that directly leads to George's suicide attempt, which in turn leads to his guardian angel Clarence showing him what life in Bedford Falls would be like if he had never been born. While Pottersville (as Bedford Falls was renamed in the alternate reality without a George Bailey) appears to be prospering, it's not the sort of town in which most people would want to live. The primary businesses on Main Street seem to be nightclubs, dime-a-dance halls, pawn shops, and strip joints. The residents of Pottersville are obviously miserable and probably living below the poverty line. Only Bert the Cop (played by Ward Bond) appears to be unchanged (one can only guess Bert was the most virtuous man in Bedford Falls or Pottersville). We are not shown Henry F. Potter in the world in which George was not born, but one can't help but wonder that he isn't happy. Of course, here it must be pointed out that, although it sometimes seems so, Mr. Potter is not all bad. In fact, like many great villains it seems likely that Potter does not think of himself as evil. After Peter Bailey's death he actually does show some admiration for the man, even if it is clear he thought of him as an idealist and sentimentalist. When there was a run on the bank he did offer to save the Building and Loan. He could have just as easily not have called George and simply approached the Building and Loan's customers himself. In fact, had he done that he might have taken over the Building and Loan the same way he took over the bank. Potter even showed some admiration for George and offered him a job, although his motives for doing so were questionable. It seems possible that Potter is any many respects a mirror image of George. That is, like George, Potter is motivated in maintaining Bedford Falls. The problem is that Potter's idea of maintaining Bedford Falls means leaving its citizens with only the barest of necessities and himself with everything else! It has often been pointed out that It's a Wonderful Life violated the MPAA Production Code in that we are never shown Potter as being punished for stealing the Building and Loan's $8,000. I rather suspect it did so because we do not have to be told that he was punished. We simply know he was. To me, at least, it seems not long after the events of the movie, Uncle Billy probably remembered he left the $8,000 in the newspaper he handed to Potter. The following investigation revealed that Potter did indeed have the $8,000 and as a result he was sent to jail. Given Potter's age at that point, he probably died there. Henry F. Potter has come to be counted as one of the greatest screen villains of all time. In its list of the 50 greatest movie villains of all time, the American Film Institute ranked Potter at no. 5. In Time Magazine's lists of the 25 Greatest Villains, Potter came in at no. 8. What is more, Henry F. Potter would have a lasting influence on popular culture by inspiring yet other villains. While it is well known that both the appearance and speech of Underdog's archenemy Simon Barsinister was inspired by Lionel Barrymore, what many do not realise is that Simon was specifically inspired by Lionel Barrymore as Mr. Potter. Montgomery Burns on The Simpsons also owes a good deal to Potter, right down to the greed and total disregard for anyone else. Of course, what made Henry F. Potter such a great villain was not simply the movie's script by Frances Goodrich, Albert Hackett, and Frank Capra. Quite simply, it was Lionel Barrymore's performance. A lesser actor might well have hammed it up in the role, but not Mr. Barrymore. Lionel Barrymore plays Potter straight, and as a result he seems all the more evil for it. As played by Lionel Barrymore, Henry F. Potter is not some caricature, stock villain, or cartoon bad guy. He is the sort of villain that could all too easily exist. Indeed, he is the sort of villain some people may have encountered in real life. Indeed, Lionel Barrymore's performance as Potter is all the more remarkable when one considers that the actor played many more roles than villains. Among his best known roles today may be that of the kindly, if irascible Dr. Gillespie in the "Dr. Kildare" movies. In A Family Affair (1937), the film that would spark the "Andy Hardy" series, Mr. Barrymore originated the role of Judge Hardy played by Lewis Stone in the series. In some respects, despite having played Scrooge on radio for many years, Lionel Barrymore was cast against type as Henry F. Potter. Many, if not most of, Mr. Barrymore's roles throughout his career were of kindly, if cantankerous characters, characters who would never dream of foreclosing on families with children or stealing $8,000. As played by the great Lionel Barrymore, Henry F. Potter has become one of the best remembered movie villains of all time. More so than even Scrooge, he has come to exemplify the trope of the evil businessman. Both J. R. Ewing and Montgomery Burns could have taken lessons from him. It seems quite likely that no other actor will every match Lionel Barrymore when it comes to playing a villainous businessman. Uggie, the scene stealing canine star of The Artist (2011), was put down August 7 2015. He had developed a tumour in his prostate gland. Uggie was 13 years old. Uggie was born on February 14, 2002 in California. Two owners rejected him as being "too wild" and he was about to be sent to the pound when he was adopted by animal trainer Omar Von Muller. Planning to only foster Uggie until he could find a forever home for him, Mr. Von Muller decided to keep the puppy and train him as an actor. Uggie made his film debut in an uncredited part in What's Up, Scarlet? in 2005. He appeared in the films Wassup Rockers (2005) and Water for Elephants (2011) before his star making turn in The Artist. Critics noted the dog's talent, often stating he stole every scene in which he appeared. 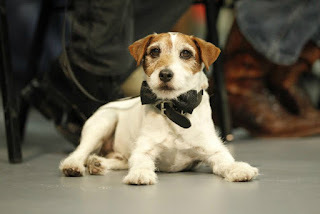 Campaigns were launched for Uggie to receive a special Oscar as well as a special BAFTA Award. He did win the Palm Dog at the Cannes Film Festival. He also received a special mention at the Prix Lumière Awards, as well as Best Dog in a Theatrical Film at the first Golden Collar Awards. On June 25 2012 his paw prints were placed in front of Grauman's Chinese Theatre. After The Artist Uggie appeared in the film The Campaign (2012) and the TV movie Holiday Road Trip. He guest starred on an episode of Key and Peele. There can be no doubt that Uggie was an adorable dog. He was quite possibly one of the cutest Jack Russell Terriers to ever appear on screen. But Uggie was also enormously talented. He knew a number of tricks and could display emotions rarely seen in dogs in motion pictures on television. In fact, he numbered among the greatest canine stars of the screen, alongside Skippy (who played Asta in the "Thin Man" movies) and Moose (who played Eddie for years on Frasier). To this day I think it was a miscarriage of justice that he was awarded neither a special Oscar nor a special BAFTA for his work in The Artist. His performance was better than most human actors. In many ways Uggie was the Henry Fonda of the canine set, the best in his profession. Sadly at 13 Uggie was a very old dog. It is sad that he could not have lived much, much longer to leave us with many more great performances. Susan Sheridan, who was the voice of , Trillian in the BBC radio show The Hitchhiker's Guide to the Galaxy and the voices of characters in a host of animated TV shows and films, died on August 8 2015 at the age of 68. The cause was breast cancer. Susan Sheridan was born Susan Thomas in Surbiton, Surrey. Miss Thomas displayed a gift for mimicry while still a child, capable of imitating a wide array of voices. She attended Brigidine Convent School in Windsor, and Ashford Grammar School in Middlesex. She trained in acting at the Guildhall School of Music and Drama in London. She acted in repertory in Westcliff-on-Sea, Ayr, and Worthing. It was in 1975 when she was playing a West End production of the musical Winnie the Pooh that her talent for voices was recognised. Voice artist and character actress Miriam Margolyes put Miss Thomas in touch with her voice agent and she auditioned for BBC Radio. In 1976 she married actor Michael Sheridan and "Susan Sheridan" as her stage name thereafter. It was in 1978 that Mrs. Sheridan voiced Trillian for the first time on the radio show Hitchhiker's Guide to the Galaxy. She performed with BBC Radio's acting company between 1980 and 1992. Susan Sheridan made her television debut as a voice artist in 1978 voicing a child in an episode of Bless Me Father. She provided a voice for an episode of Armchair Theatre and appeared in front of the camera in an episode of Agony. The Eighties would prove to be a busy decade for her. Starting in 1990 she provided the English voice of Moomin in the anime TV series Moomin. She also provided voices for the animated shows The Family-Ness, Jimbo and the Jet-Set, Muzzy in Gondoland, and Muzzy Comes Back. She was the voice of Eilonwy in the Disney animated feature The Black Cauldron (1985). She provided the English voices of Michael and Judy in the anime TV film Lupin the Third Bye Bye, Lady Liberty. In the Nineties she provided voices for the stop motion animated TV programme Noddy's Toyland Adventures. She was the voice of Milady de Winter in the English dub of the French animated series Albert the 5th Musketeer. She provided voices for the TV specials Santa's First Christmas and Father Christmas and the Missing Reindeer. In the Naughts she provided a voice for episodes of the animated shows The Lampies and Jambareeqi Reviews. In the teens she guest starred on Midsomer Murders. Susan Sheridan was one of the greatest voice artists of all time. She could do a wide array of voices. Indeed, she was equally adept at doing the voices of children and adults. Susan Sheridan could do the voices of everything from an infant to an old woman, and always sounded convincing. There were very few voice artists who could ever match her. Last week I had to write several eulogies for this blog and sadly this week looks to be more of the same. For that reason I decided to take a break from writing eulogies today and leave you with something somewhat happier. This is an old Scopitone film made for French singer Françoise Hardy's first hit, "Tous les garçons et les filles" (literally "All the Boys and the Girls"). The song was released in June 1962 and became a smash hit in France. It even proved to be a bit of a hit in the United Kingdom, reaching no. 36 on the British singles chart. As to the subject matter of the song, it is from the point of view of a girl who has never been in love, but who wants to be in love like other boys and girls her age (did I say it was somewhat happier?). As to the film, it was made for the Scopitone, a visual jukebox introduced in France in the late Fifties. While Le Scopitone would prove somewhat popular in France, the jukebox never gained ground in either the United Kingdom or the United States. It persisted in France until 1978, when the last Scopitone film was made.